Mansi Gupta’s thesis, titled “BETTER: The Prejudices & Practices of Mass Production,” began with one goal: to bring sustainability to the larger fashion system, especially the factories that produce the garments. For decades, the fashion industry has been criticized for having a negative social and environmental impact through its production practices. As a response, a green fashion trend, recently known as “sustainable fashion,” has emerged in the form of small brands, marketplaces and protests against fashion factories. Using the ideas of sustainable fashion as inspiration, Gupta wanted to devise ways that sustainable production methods could be adopted by factories as well. After interviewing multiple experts in the field to understand the myriad issues, challenges and languages of sustainability in fashion production, it was clear that Gupta’s work needed to address a kind of systems intervention. Every expert provided her a different definition of sustainability, pinpointing what they thought were the most urgent challenges; Gupta began to see the territory of fashion production and sustainability as a complex system made up of many stakeholders. And to ground her work, she resolved to define sustainability for herself. Inspired by Shona Quinn, Sustainability Leader of Eileen Fisher, Gupta defined sustainability as “continuous, incremental change,” and created (BETTER)’, a platform and ecosystem that spoke to factories, consumers, producers and brands. The platform argues that radical and holistic change can be overwhelming, but that “everyone can do a little bit better.” And, of course, a few betters along the way start to equate to good. (BETTER)’ began as an accessible labeling and certification system for factories that were producing product using a ‘better’ method of production. Serving as an education platform for all stakeholders of the system, it also served as a crowdvoting and storytelling space—for factories to tell their stories, for consumers to have a voice and to support sustainable initiatives that they wanted to see come to life. Gupta further developed (BETTER)’ as a service. There is a growing demand for stories about where our things come from, and where our things are made. And since most production takes place in factories, Gupta chose factory owners, managers, and workers as her core audience for the service. Factories don’t know how to tell their stories, or indeed, they may not have any proud stories to tell. Further, factories are often not aware of the importance of being more sustainable and transparent, and they often do not know how, or have the means to be more sustainable and transparent. (BETTER)’ is a service that creates a story that factories will want to tell, by unveiling business opportunities in the factory’s existing system through experimentation, branding and storytelling. (BETTER)'—the service—is a multi-tiered platform for improving production practices and increasing transparency in factories. It seeks to transform the stigma surrounding manufacturing that sees factory work as necessarily monotonous, devalued, and unsustainable. (BETTER)' seeks to undertake this work on a number of levels—economic, systemic, practical and social. On an economic level, (BETTER)' helps the factory find a business opportunity that results from the adoption of better production methods. Changing or introducing a new production method includes switching costs, and (BETTER)' understands the importance of providing a way of financially supporting the changes through a new revenue stream. (BETTER)' is also cognizant of the fact that factories may not necessarily know how to market their new business opportunity or product, and therefore provides a marketplace to help them kickstart their product/new business venture. On a systemic level, (BETTER)' suggests changes and business opportunities to factories within their existing system through small, systemic interventions. On a practical level, (BETTER)' introduces the system intervention to the factory as an experiment. (BETTER)' realizes that any change will require prototyping and iteration in order to be successful, and by framing the change as an “experiment,” (BETTER)' creates room—and permission—for failure and learning. On a social level, (BETTER)' plays the role of helping factories tell their stories of small changes in an effort toward increased transparency. 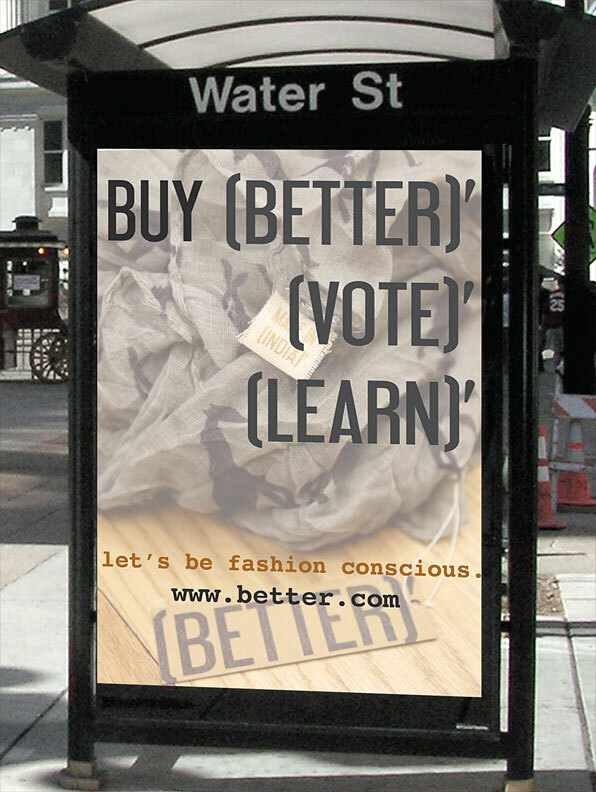 (BETTER)' accomplishes this through its marketplace, an e-commerce platform where consumers can support the factories by buying factory products after learning the story of how they were made, where they were made, and by whom. (BETTER)’ was prototyped with Prachi Leathers, a leather factory and tannery located in Kanpur, India. A visualization of the existing system at Prachi helped to identify a story that producers would want to hide, and (BETTER)’ transformed it into one that they would want to tell. Identifying leather scraps—waste that resulted from the factory’s everyday production, and which usually ends up in landfill—as a story that they would want to hide, served as a fitting opportunity to prototype an initial small change. As a second service prototype, (BETTER)’ was taken out to factories in the garment district of New York, and ultimately worked with Baikal Handbags. This collaboration yielded a voice for the factory, through which it shared its operations and aspirations. As a final piece, Gupta created a design performance response to the perception of factory workers. Through her year of work and research, she found the perception of factories to be predominantly negative—most people imagine factory workers to be faceless victims of monotony and sadness. But since Gupta grew up seeing factory work as proud, dignified work, she wanted to see if dance could contribute to a more constructive dialog. She created ‘The Manufacture Movement’ as a way to appreciate the dignity of factory work—in the ways that the workers appreciate it themselves. Factories are a great first step, Gupta believes. The values of accelerating incremental change, transparency and appreciation can be applied not only to fashion, but to all kinds of manufacturing systems as well. Through these steps, Gupta envisions building conversations, experiments, brands and products that will continue and strive to be...even better. Read more about the project, including subject matter experts and research protocols in the PDF above. See more of Mansi Gupta’s work at her website mansigupta.com, and email her at mgupta[at]sva[dot]edu.